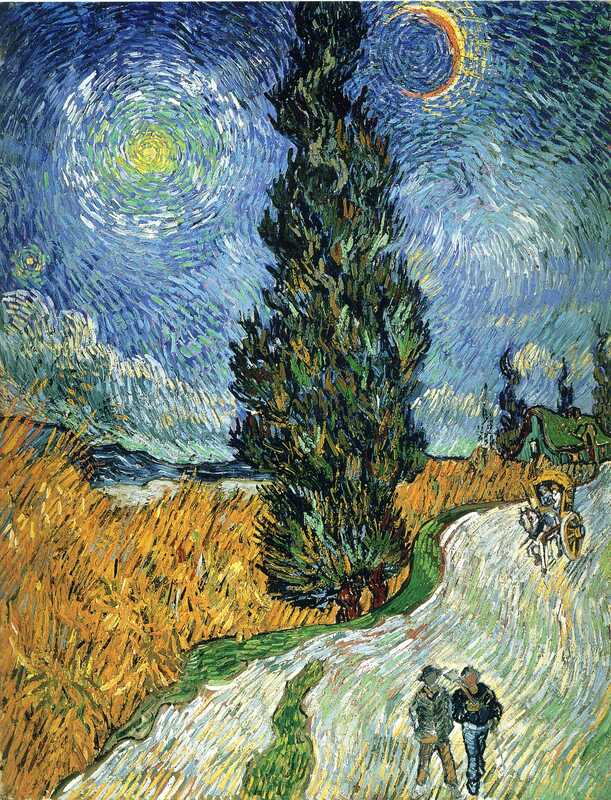 Vincent van Gogh, Road with Cypress and Star (1890), oil on canvas, 92 x 73 cm, Kröller-Müller Museum, Otterlo. WikiArt. This serene and startingly colourful nocturne took painting from the heights of Impressionism towards several radical movements of the twentieth century. A clear and starry night on the bank of a wide, calm river, with the water and sky filling most of the painting. In the foreground, at the mid-right of the bottom edge, a couple walks towards the viewer, arm in arm. Immediately behind them are vague partially-lit forms suggesting objects under tarpaulins, with three small yachts moored to the bank. In the distance, the bank curves from the centre of the left edge, up and back to a gap to the right of centre. The other bank forms a shorter, slightly inclined line from that gap to reach the right edge. On both banks are the dark silhouettes of a variety of buildings, with occasional towers, in front of which there is a fairly regular series of bright amber lights. Each light gives rise to tall and thin columnar reflections on the rippled surface of the water. The sky is paler in the centre of the painting. Several stars are shining brightly, with lemon bursts around each. Seven form the constellation of Ursa Major, which lies straight ahead of the viewer. No moon is shown. 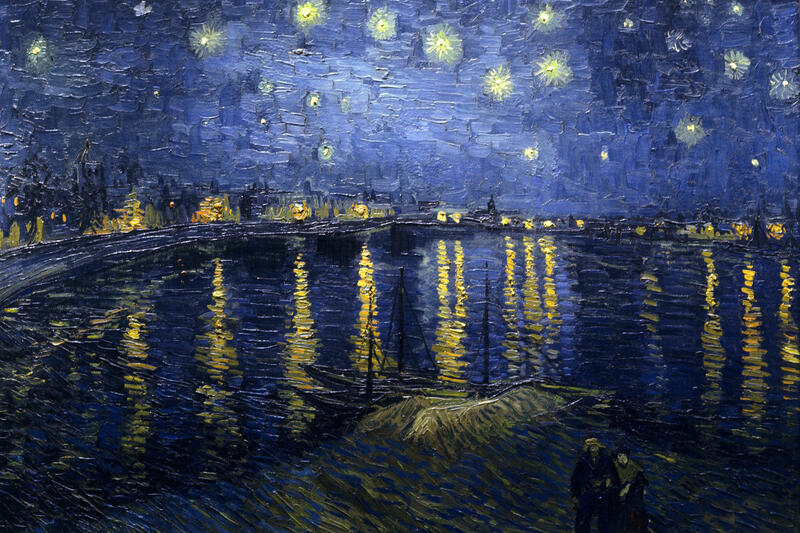 Vincent van Gogh, Starry Night over the Rhône (1888), oil on canvas, 72.5 x 92 cm, Musée d’Orsay, Paris. WikiArt. The paint has been applied in broad, thick strokes across much of the surface, except for the lights and their reflections, the stars, and the foreground. Although mainly a dark ultramarine blue, passages in the centre are paler, and buildings darker, towards black. Vincent van Gogh, Vincent’s House in Arles (The Yellow House) (1888), oil on canvas, 72 x 91.5 cm, Van Gogh Museum, Amsterdam. WikiArt. 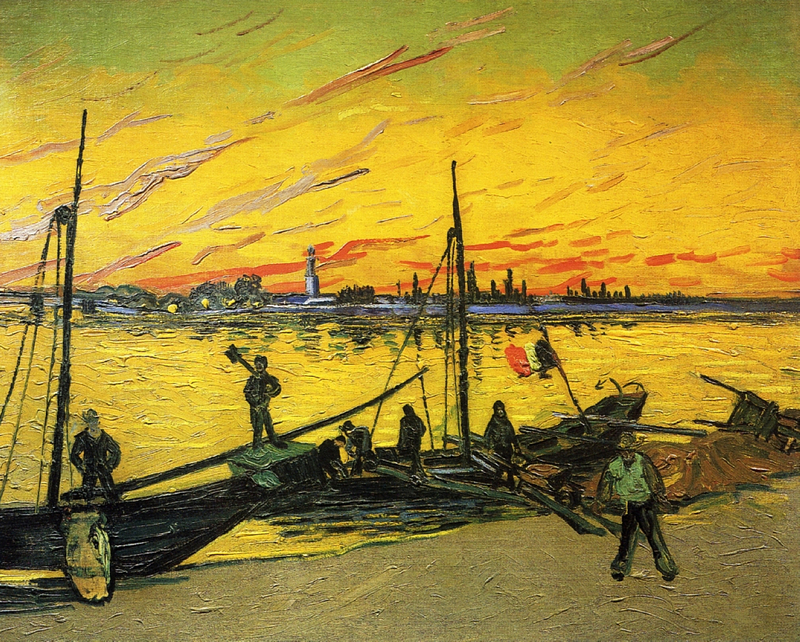 The location has been identified as a quay on the east bank of the River Rhône, a couple of minutes walk from van Gogh’s Yellow House in Arles, looking towards the south-west. However Ursa Major would only appear as shown if the view had been to the north. It is therefore most likely that the painter chose to form the stars into that constellation. This painting was first exhibited the following year, at the annual exhibition of the Société des Artistes Indépendants in Paris. Vincent van Gogh was born in the Netherlands on 30 March 1853. His father was the minister of the local Dutch Reformed Church. In 1869 he started work with an art dealer in The Hague, who transferred him to London in 1873, but he became dissatisfied with the treatment of art as a commodity, and lost his job in 1876. He returned to England to work without pay in a boarding school, then became a Methodist minister’s assistant. He started to study theology in Amsterdam in 1877, but failed the entrance exam and a subsequent course to become a Protestant missionary. In 1879 he worked as a missionary in the coalfields of Belgium. His drawings led to his younger brother Theo suggesting that he study art, so he started at the Académie Royale des Beaux-Arts in Brussels in 1880. He moved to The Hague and set up a studio with the assistance of Anton Mauve in 1882, where he started to paint in oils. He lived with an alcoholic prostitute and her young daughter, the former giving birth to a son later that year; he left them in 1883. He continued to draw in Nuenen, and completed nearly 200 oil paintings before moving to Antwerp in 1885. There he studied colour theory, the work of Rubens, and collected Japanese Ukiyo-e woodcuts, but ate frugally and started to drink absinthe heavily. Vincent van Gogh, Le Moulin de la Gallette (1887), oil on canvas, 46 x 38 cm, The Carnegie Museum of Art, Pittsburgh. WikiArt. He moved to Paris in 1886, staying with his brother Theo, who had an art gallery on Boulevard Montmartre. He worked at Cormon’s studio and studied the work of Monticelli. He met painters including Émile Bernard, Toulouse-Lautrec, and Signac, and for a while adopted the Divisionist style of ‘pointillism’. In 1887 he befriended Gauguin, and exhibited with Bernard and others. He moved to Arles in 1888, where he aspired to found an art colony, leasing a wing of what was known as the Yellow House, and inviting Gauguin to visit in the hope that they would start the colony. When Gauguin arrived in October 1888, they painted together and visited Montpellier, but started to quarrel fiercely about art. 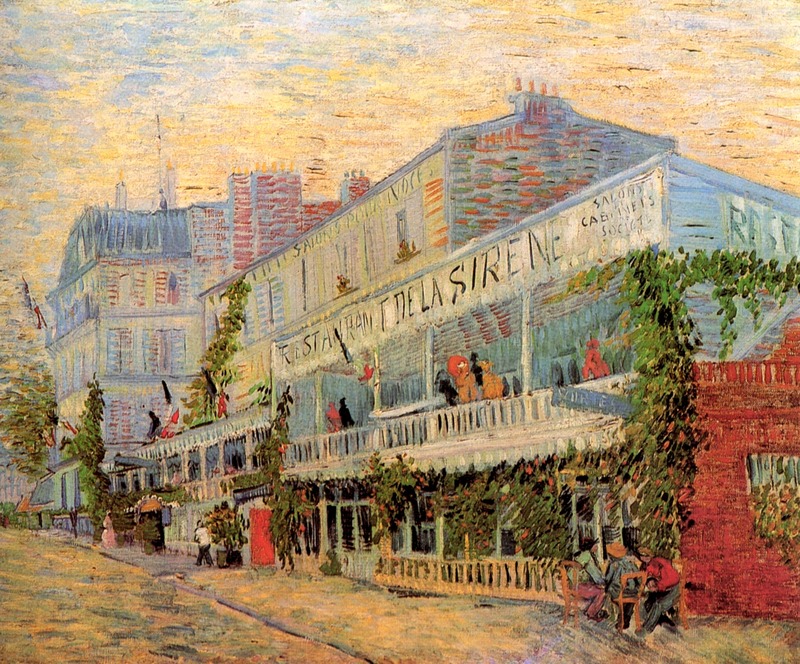 Vincent van Gogh, Restaurant de la Sirène at Asnières (1887), oil on canvas, 54 x 65 cm, Musée d’Orsay, Paris. WikiArt. Van Gogh cut part of his ear off in an act of self-mutilation during an acute psychotic episode, Gauguin left, and van Gogh was admitted to a mental hospital. Although he appeared to recover quickly, van Gogh continued to suffer from hallucinations, and was deluded that he was being poisoned. In May 1889 he was admitted as a voluntary patient to the Saint-Paul Asylum less than 20 miles from Arles. A year later he moved to Auvers-sur-Oise, to be near his brother Theo and Dr Gachet. Gachet painted and had provided extensive support to artists, particularly Impressionists. Unfortunately van Gogh’s mental state deteriorated, and on 27 July 1890 he shot himself in the chest with a revolver, dying on 29 July 1890 from the resulting infection. Vincent van Gogh’s most productive period, which was tragically to be the final three years of his too brief life, occurred at a time of huge change in painting, and art more generally. The Impressionist movement had reached maturity, and several of its members were enjoying more critical success and resulting sales; some felt that the movement was then a spent force for change. Pissarro, Seurat, Signac and others had started to experiment with Divisionism and were splitting from the Impressionists amid opprobrium. Cézanne and Gauguin were following their own independent routes towards Post-Impressionism. 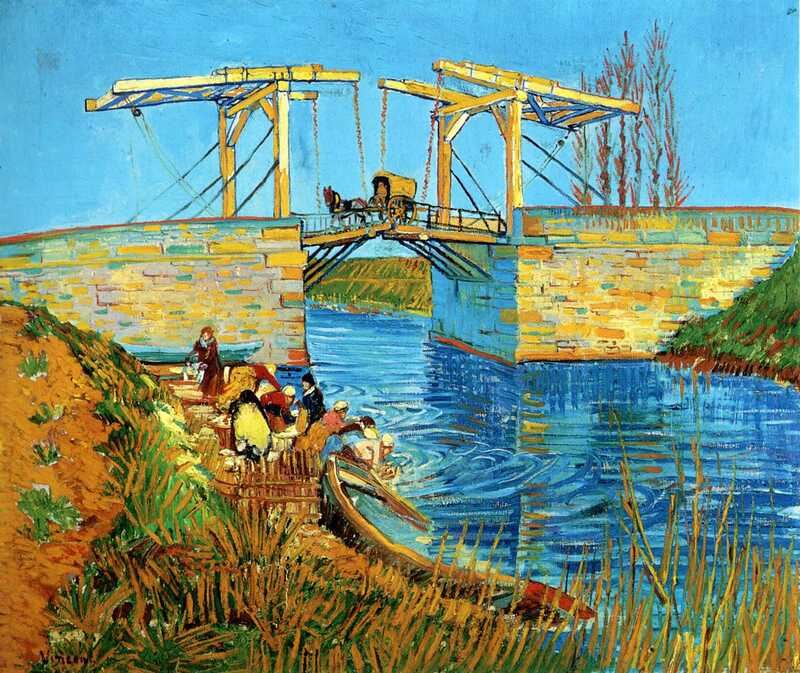 Vincent van Gogh, The Langlois Bridge at Arles with Women Washing (1888), oil on canvas, 54 x 65 cm, Kröller-Müller Museum, Otterlo. WikiArt. Van Gogh was the third independent launching into the future, after his work moved on from its brief impressionist period of 1886-7. He started to use more vivid colours, applying them in bold strokes which swirled and built form into trees, fields, and the sky. Although his paintings remained thoroughly representational, they took on an appearance which is distinctive of van Gogh, and markedly different from Impressionism and the other movements of the day. Vincent van Gogh, Coal Barges (1888), oil on canvas, 71 x 95 cm, Private collection. WikiArt. There has been much debate about the relevance of van Gogh’s mental disorder to his paintings. The evidence in those paintings is that he was able to produce a coherent and consistent body of work despite episodes of acute psychosis, and it would therefore be completely inappropriate to ascribe the style or qualities of his paintings to that illness. Other professional artists who suffered similar illnesses, such as Richard Dadd, were often able to maintain their output through periods of illness. These paintings are very definitely the products of the genius of Vincent van Gogh, not the passing effects of mental illness. 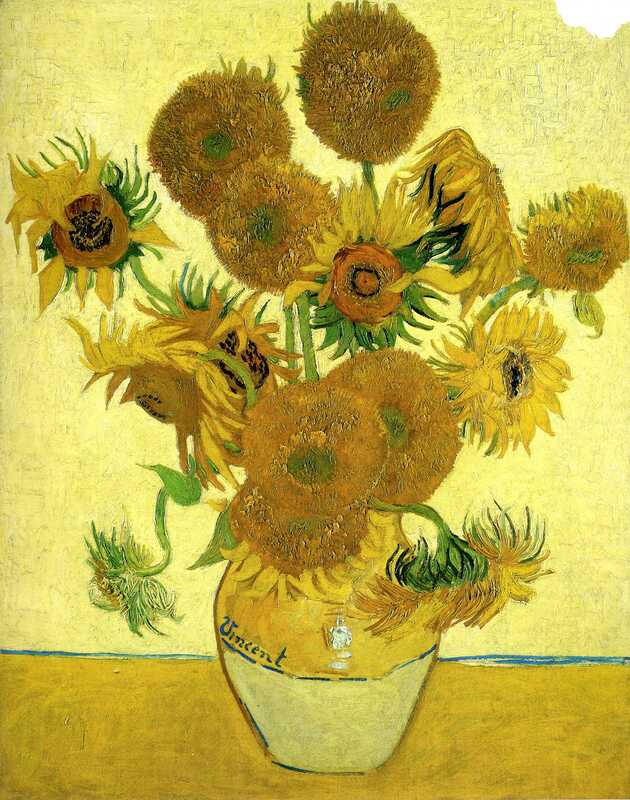 Vincent van Gogh, Still Life: Vase with 15 Sunflowers (1888), oil on canvas, 93 x 73 cm, The National Gallery, London. WikiArt. Nocturnes, as such night paintings are often termed, had been relatively unusual, although both Rubens (Landscape by Moonlight, 1635-40) and John Constable (Moonlight Landscape with Hadleigh Church, 1796) painted wonderful examples. 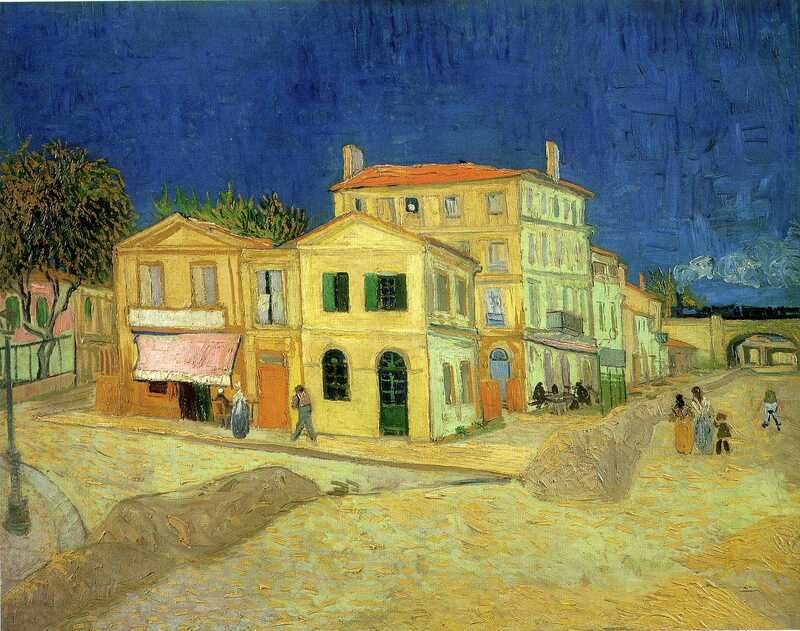 Van Gogh painted three justifiably famous nocturnes in his final years: The Cafe Terrace on the Place du Forum, Arles, at Night (1888), this work, and the best known Starry Night (1889), as well as a portrait of Eugene Boch (1888), and the clearly nocturnal The Night Café in the Place Lamartine in Arles (1888). An unusual feature of this painting is the prominence of artifical light, in the waterside gaslights and their profuse reflections. Like railways and other elements in the motifs of Impressionist and Post-Impressionist painters, gas lighting was a novel sign of the times. It is easy in the 21st century to see such lights as commonplace, but such extensive lights were still relatively unusual, and most of the landscape still unlit and dark at night. The stars, lights, and reflections are prominent, dominant, and depicted in the way that only van Gogh could. It is only appropriate that this painting was shown in the fifth exhibition of the Société des Artistes Indépendants, a group which featured Neo-Impressionists, and later Fauvists, Cubists, Orphists, and Dadaists, and the likes of Braque and Matisse. For in van Gogh’s late works there are features which anticipate several of those future styles, and which were of profound influence to many painters of the twentieth century. Vincent van Gogh achieved more in those frantically productive three years than other great painters do in their entire working lives. 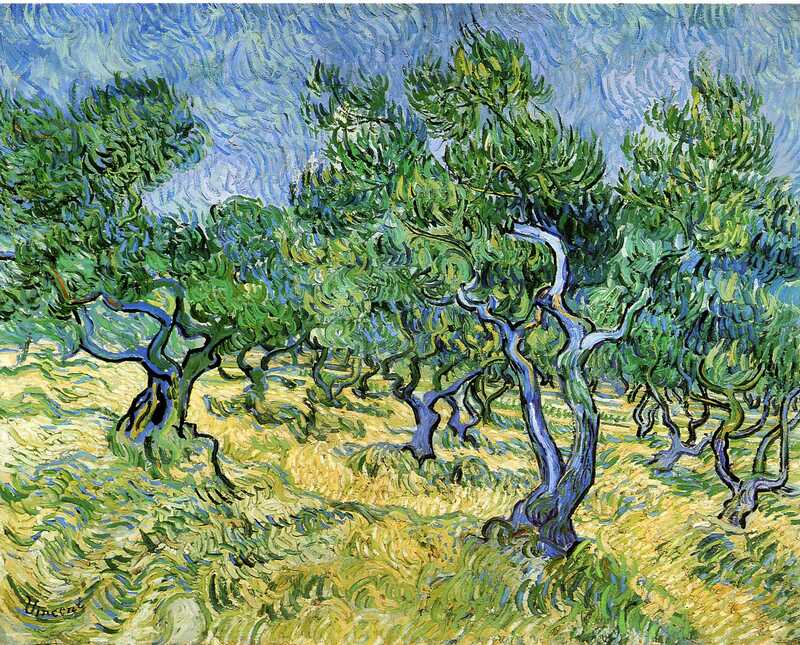 Vincent van Gogh, Olive Grove (1889), oil on canvas, 72 x 92 cm, Kröller-Müller Museum, Otterlo. WikiArt. Alain Jaubert, Palettes DVD: La Révolution Cézanne, La haute note jaune, Editions Montparnasse. 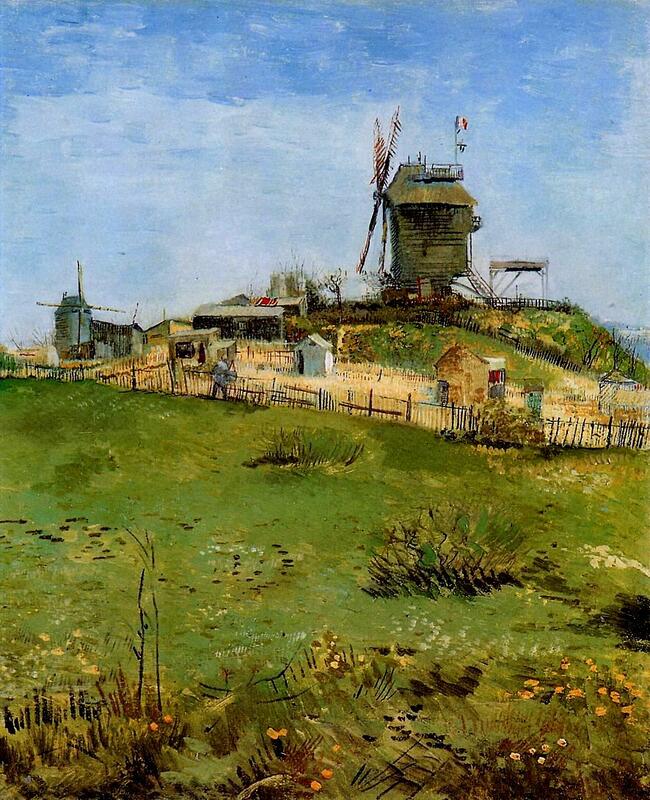 (A complete 30 minute programme in this superb series, about van Gogh’s paintings in Arles.) Details. Posted in Painting and tagged Arles, Gachet, Gauguin, nocturne, painting, Post-impressionism, van Gogh. Bookmark the permalink. I have this painting, it was given to me by someone who didn’t like it. I love the colors. I always say that’s my husband and I when we get old.